The content of this page was updated on 8/14/2012. A variation of this MBR article was published in the November/December issue of The New Brewer (the journal of the Brewers Association). 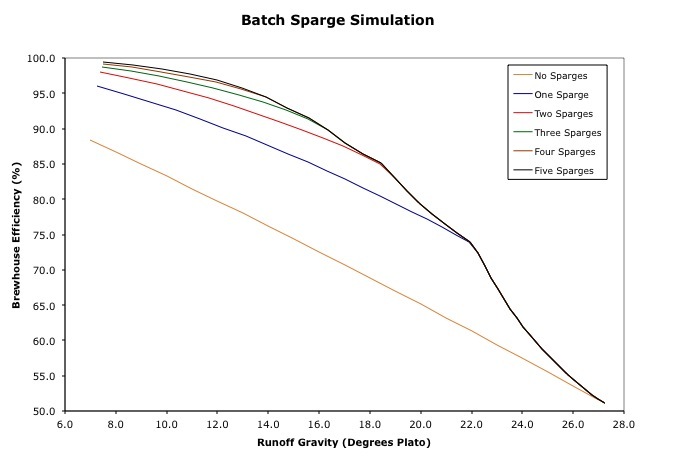 Before submitting the article I ran simulations of two, three, four and five batch sparges, which illustrate how the solutions convergence on a single answer as more sparges are added. It also changed the brewhouse efficiency multipliers by small amounts, which I'll get to shortly. I recently read a thread on a professional brewers' forum about the logistics of no-sparge lautering. I was surprised to see the topic because very few commercial brewers employ the method. 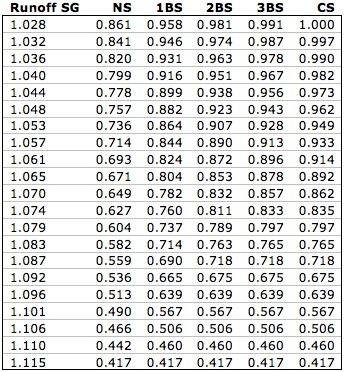 The reason why is because it's colossally inefficient, as shown in the chart below. However, many homebrewers believe it results in better beer. The theory is straightforward: during the lauter, the wort in your lauter tun is always at the same gravity as the wort in your kettle. Because the wort in the lauter tun is always relatively dense, and therefore well-buffered against pH increases, fewer tannins are extracted from the husks. Now, before you decide to mash in with all of your brewing water to reduce tannin extraction, I'd like to point out that the enzymes responsible for creating complex protein-degradation products (which Jean De Clerck believes are far more important to mouthfeel than dextrins) work best in thick mashes. 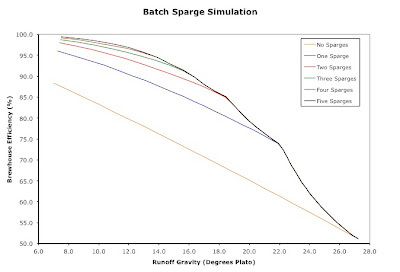 There's a simple solution, though: mash like you normally would for continuous sparging and mix in all of your "sparge" water shortly before vorlauf. I won't be using the no-sparge method anytime soon because my mash/lauter tun is too small to hold the grist plus all of the water for a full-size batch. 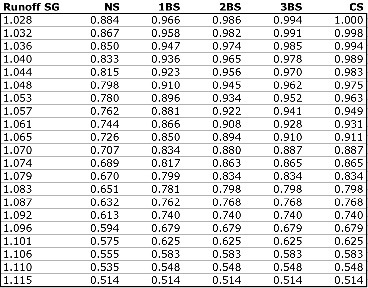 That doesn't damper my academic curiosity, though, so I created a set of no-sparge brewhouse efficiency multipliers and added them to the latest version of my chart. Switching topics, expect a water treatment overhaul in the next few months. I'm hoping to avoid another six-part series, but we'll see. What's your favorite Central Waters beer? Me? That's easy - Kosmyk Charlie's Y2K Catastrophe Barleywine. It's my go-to winter beer. I'm not sure there's a better barleywine in the universe. I'm not a big stout person, so much of Central Waters' oeuvre is wasted on me, unfortunately. I'm curious about those experimental IPAs and the Bourbon Barrel IPA (who didn't see that coming?). "It is always flattering when less imaginative competitors copy our beers, packaging, and/or marketing. I usually accept this as a personal challenge to do something more. When our trademarked Solstice name was infringed on, I regrouped with Dancing Man. When lots of deconstructed 4 and 6 packs showed up I knew I was doing a good job. When another Midwestern brewer released a "Un*******" series. I thought I can do better." Deb is no doubt referring to the "Unchained" series from St. Paul brewery Summit, which has been churning out excellent beers under that label for a couple of years now. I suppose "Unchained" is a bit derivative of "Unplugged," though I don't think anyone would confuse the two. Regardless, this new limited release Barley Wine is a "Thumbprint" beer. Made with Styrian Golding, Willamette, Columbia and Sterling hops. Aroma: Tropical fruit with a spicy, floral hop note. Flavor: Earthy hop flavor up front with just a hint of citrus, followed by a malt sweetness blending with a bracingly bitter finish. A bit of alcohol warmth in the finish as well. Enough malt flavor to tame the hops just a bit, but the bitterness is the focus. With a slightly thinner body, this could easily pass for a Double IPA. Summary: New Glarus Unplugged/Thumbprint beers can often be fascinating without being intense; that's part of the reason I still have fond memories of beers like their Bohemian Pilsner and Berliner Weiss. But as they proved last year with their stellar Double IPA, they can go big when they want to, and this is another example. In a way this rides the line between American and British style Barley Wines; it is American in the high hop flavor, aroma and bitterness, but the hop profile strikes me as more European than American. Willamette and Sterling are American hops, they don't have the citrusy quality of popular west-coast hops like Cascade and Centenial (Sterling has noble hop lineage, it should be noted). An interesting and well orchestrated take on the Barley Wine style. Though the hop flavor will die down in time, this could be a good beer for the cellar as well, though hop heads should drink it while it's fresh. OK, I know there's a lot of stuff going on out there. I've gotten plenty of press releases that are all buried under the mountains of email that I get. So, if you know of an event happening in the next 60 days (before April 1, 2012), post it in the comments. The Schmaltz Brewing Co's 15th Anniversary - January 28th, 2012, 11am - closing - Schmaltz Brewing Co. will take over the taplines at Dexter's. Breast Cancer Recovery Benefit - February 12th, 2012, 12pm - 4pm - The annual beer and chocolate event is a lot of fun and helps to raise money for the Breast Cancer Recovery Foundation. Minimum donation of $20. Oh. And, keep your calendars open the first week of May. 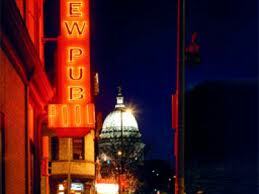 Madison Craft Beer Week starts May 4 and will run until May 13th. More details in the coming weeks. This series of posts is brought to you by beer bloggers across the Midwest. 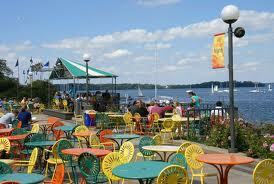 Robyn, of Madison Beer Review, wrote the last article about a beer weekend in Madison. Your handy-dandy guide to Indianapolis (just in case you decide to use those Super Bowl tickets you bought when you were delusional enough to think the Packers might actually make it) was brought to you by Mike over at Hoosier Beer Geek. Jeff is Bears' fan. Tough luck Packers. Opened in 2007, Chris and Molly Eley's Goose the Market (2503 North Delaware, (317) 924-4944) quickly became a hub in Indianapolis' growing gourmet and local food movement. 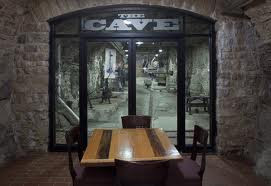 In June of 2010 they opened up their basement space to create the Enoteca, "a casual place to drink wine" (and beer), featuring six ready-to-drink beer choices, as well as anything from the well-selected varieties on their store shelves. While the beer selection is nothing to blink at, it's the Enoteca's food that's the star. With selections such as duck rillette, terrine, charcuterie, or one of their highly-regarded sandwiches, there's something adventurous and tasty waiting for you. With a focus on local and regional beer selections - "(beer from) the people that I know" - Broad Ripple Brewpub brewer Kevin Matalucci's Twenty Tap (5408 North College Avenue, (317) 602-8840) is one of your best bets for getting a taste of beer from all over the state. It's worth noting that Twenty Tap offers half-pours of any of their beer selections, allowing patrons to moderate their sampling. Chef Rob Coates keeps a menu of expected bar food favorites interesting and upsale, yet remarkably affordable. The vegan bahn mi sandwich is a Hoosier Beer Geek favorite. 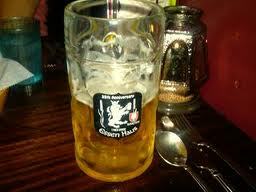 But if want to try Kevin Matalucci's beer.. Despite owning Twenty Tap, Kevin Matalucci still holds down a regular job as a brewer at the Broad Ripple Brewpub (842 East 65th Street, (317) 253-2739). English expatriate John Hill opened the brewpub in 1990, in an effort to bring an authentic English pub experience to Indianapolis. He did more than that, launching the careers of more than one Indiana brewer, and creating an Indiana craft beer monument. Matalucci's English-style ales and an extensive menu help complete the effort. Order whatever is on the hand-pull. As further proof of the influence of John Hill and the Broad Ripple Brewpub, stop in at Ted Miller (and his wife Shannon Stone's) Brugge Brasserie (1011a East Westfield Boulevard, (317) 255-0978). Miller began his brewing career at the Brewpub before traveling the world, and ultimately returning home to open this Belgian-style Gastropub. Ask your server if there are any sours on tap, and be sure to order the frites (fries), which are among Indianapolis' best. When restaurateur Scott Wise finally got around to opening a brewery to support his local chain of Scotty's Brewhouse restaurants, he wasn't quite prepared for the success of his beer sales directly from his brewpub. Thr3e Wise Men (1021 Broad Ripple Avenue, (317) 255-5151) is that brewpub, and it remains the only Wise owner restaurant to carry his beer. Brewer Omar Castrellon puts his 20+ years of brewing experience to practice brewing styles that live up to Wise's vision. The pizza will come in handy after a full day of drinking. Still with us? After yesterday's effort you'll probably want to wait until noon before you start drinking again. Start your day at Good Morning Mama's Cafe (1001 East 54th Street, (317) 255-3800) a former filling station turned breakfast stop. There's a menu full of the breakfast classics, as well as the Hoosier Loco Moco, a sort of KFC Famous Bowl of breakfast foods, featuring rice, cheesy grits or potatoes, an egg, a beef, sausage, or spam patty, with a biscuit top, all covered in gravy, all for just $7.99. I don't order that, but it's an option. Indianapolis' City Market (222 East Market Street) has gone through many changes over its recent history, but finally seems to have hit its stride with the additions of a Saturday farmer's market and the Tomlinson Tap Room (upstairs in the main hall, west wall). The former can provide produce or baked goods for snacking along the route today, while the latter can get you started on drinking by providing a full list of beer from Indiana's breweries. Partially owned by the Brewers of Indiana Guild, Tom Tap often features Indiana's harder-to-find craft beer selections. Keep an eye out for something from Three Floyds. If you're hungry, check out Papa Roux on the lower level for a po' boy. Now that you're back to drinking, your first brewery stop today should be at Flat12 Bierworks (414 North Dorman Street, (317) 635-2337). Since opening in 2010, Flat12 has gained a dedicated local following for their "tradition with a twist" approach, leading to a myriad of variations of their house lineup, as well as an adventurous attitude towards their specialty beers. A short trek southwest bring you to Sun King Brewing Company (135 North College Avenue, (317) 602-3702) where - if you got there in time - you can catch a 2 p.m. brewery tour. Sun King recently made big waves in craft beer community, capturing eight medals at the Great American Beer Festival, and showing the country what Hoosiers already knew: Indiana makes great beer. After your tour, head north on College and then north east on Massachusetts Avenue (Mass Ave to locals), where you'll be spending the rest of your day. Just before the road turns north, you'll run into Black Market 922 Massachusetts Avenue (317) 822-6757) - but only if you know where to look. Cross the sidewalk, find a parking spot, and step into one of Indy's best restaurant spaces. The food lives up to the space, with locally sources selections that put a modern spin on traditional Hoosier favorites. The following list of Mass Ave establishments provides a little something for everyone, so you can pick and choose who suits you best as you work your way back towards downtown from Black Market. Best Chocolate in Town (880 Massachusetts Avenue, (317) 636-2800): Yes, this is a chocolate shop. But this chocolate shop offers truffles made with Sun King's Wee Mac. Definitely worth a visit. Mass Ave Pub (745 Massachusetts Avenue, (317) 974-0745, smoking permitted): Smokers in your group will appreciate the fact that they can enjoy a pint and a cigarette in this locally owned neighborhood pub. A surprisingly deep selection of craft beer rounds out the experience. Chatham Tap (719 Massachusetts Avenue, (317) 917-8425): Like soccer? We do. Chatham Tap is the default choice for fans wishing to catch a bit of English Premier League action. That tap list follows format, with the standard English selections, as well as local taps and a nice bottle list. The Flying Cupcake (715 East Massachusetts Avenue, (317) 536-0817): No beer here, just a cooler full of cupcakes to satisfy your beer-drinking sweet tooth. Yats (659 Massachusetts Avenue, (317) 686-6380): An Indianapolis cheap food institution, Yats provides diners with a plate of something saucy and cajun in a pile of rice. Chili cheese etouffee, anyone? The Rathskeller (401 East Michigan Street, (317) 636-0396): If you're the German beer-hall type, Rathskeller is your Indianapolis answer. A full selection of German-made styles await you, as well as a sausage-heavy menu that fits the atmosphere. Chatterbox Jazz Club (435 Massachusetts Avenue, (317) 636-0584, smoking permitted): The Chatterbox Jazz Club - a Mass Ave original - is the divey-est of dive bars, with a legendarily dusty interior, the most interesting stage carpet that ever existed, and bathrooms that are either scary or entertaining, depending on your outlook. Your best drink option is probably Sun King in a can. But what an atmosphere! Old Point Tavern (401 Massachusetts Avenue, (317) 634-8943, smoking permitted): Something about Old Point is just plain cool. Maybe it's the wedge shaped building, or the girl dancing on the sidewalk outside, or perhaps even the extensive beer menu. In any case, the cozy confines provide plenty of entertainment. MacNiven's (339 Massachusetts Avenue, (317) 632-7268, smoking permitted): You might be thinking that a place named MacNiven's is an Irish pub. You'd be wrong: MacNiven's is a Scottish/American Pub. It also features one of Indianapolis' most extensive beer lists, and regular and rare tapping from the likes of Sun King, Bell's, and Three Floyds. And I haven't even mentioned the giant folded cheeseburger and the awesome haggis! Ball & Biscuit (331 Massachusetts Avenue, (317) 636-0539): Perhaps the most polished of all the Mass Ave bars is Ball & Biscuit, a cocktail lounge with a very solid beer lineup. The cozy spaces are made even more comfortable by the lack of televisions. This is a bar built for conversation. Bazbeaux (333 Massachusetts Avenue, (317) 636-7662): Once again we end the night with pizza - this time from an Indianapolis institution that provides a full selection of craft bottles to keep you on even keel. Opened since 1989. Act like a tourist, finally. If you've survived to straight days of drinking, today's the day to catch a few easy local tourist areas. At the center of Indianapolis lies the Soldiers and Sailors Monument (1 Monument Circle), perhaps best known as the only part of Indianapolis they show during national football telecasts. If you manage to make it up to the viewing deck, keep in mind that Hoosier Beer Geeks' very own Jason Larrison is the architect responsible for those vertical windows you're looking out of. A little bit north of Solider and Sailors lies the Indiana War Memorial (431 East Meridian Street) perhaps best known for this), the American Legion Mall, and the Central Library (40 East St. Clair Street). While I wouldn't normally recommend a library for tourists, our features one of the best views of the city, as well a pretty impressive interior. Lastly, a visit to Indianapolis wouldn't be complete without a stop to Maxine's Chicken and Waffles (132 North East Street, (317) 423-3300) for a stomach full of fried chicken goodness for the drive home. A word of warning, though - show up early and beat the church crowd. Indianapolis cab companies: All this drinking calls for either a designated driver or the services of a cab driver. To be honest, Indianapolis' cab companies don't have the best reputation, but they are still, in many cases, your best option. Headline caught your attention? Well. I'm serious. According to data, almost 90% of craft beer drinkers are white. IMPACT 2009 (Simmons Market Research)*. 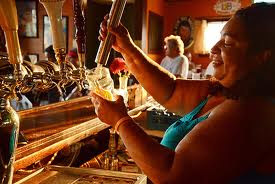 A mere 3% of craft beer drinkers are African-American, while around 5% are Hispanic or Latino. African-Americans comprise at least 12% of the United States. 16% of the United States is Hispanic/Latino. A full 38% of African-American households would at least be classified as "middle-class", while around 10% of the African-American population would be considered "upper" or "upper-middle". Yet very few of them are drinking craft beer. Just wondering why that might be. * Data is referenced as part of a BeerAdvocate forum. I don't normally attach much weight to BeerAdvocate forums, but this matches with other data that I've seen in more "proprietary" formats. It's one of the few places where this kind of information is not behind a (very expensive) pay wall online.